Losing the first match of the World Cup didn’t keep Spain down for long in South Africa four years ago, but this repeat of that tournament’s final had a far more ominous feel to it. The defeat to Brazil at the Confederations Cup and Barcelona’s fall from grace in recent years suggested that maybe, just maybe, Spain’s cycle was approaching its end. This defeat screamed freefall. Nevertheless, it is worth remembering at halftime you were still probably better off putting your World Cup free bets on the reigning champions. Unlike Switzerland four years ago, the Netherlands weren’t scared of their medal-adorned opponents and looked to actually get at them, which exposed some foibles of their own. 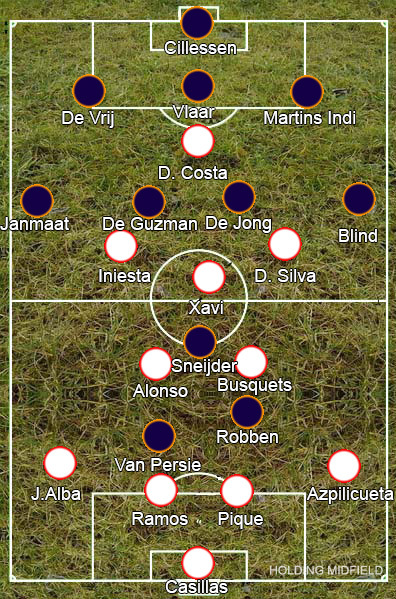 As ever, Spain’s gameplan was based on playing the ball between their small, technical midfielders, with nominal widemen Andres Iniesta and David Silva joining the centre in a narrow 4-2-3-1. The key difference from their previous template was the addition of Diego Costa as a proper forward to lead the line. The Brazilian-born striker didn’t have a particularly good game, but then he isn’t really an obvious mix with this Spanish team. Atletico Madrid play a far more counter-attacking strategy than the Barcelona-mimicking national team, and Costa’s job is to harass the opposing defensive line and provide an early outlet, which is atypical to the Spanish style. This meant Spain were frequently trying to catch Costa with long passes and through balls rather than keeping the ball as they would have previously done – a new-found directness that could well be argued is beneficial to them, although at this point we can only say it was different and Costa and Spain’s poor showing doesn’t exactly indicate a promising future. What was most worrying for Vicente del Bosque about Diego Costa’s performance is that this was the kind of game in which he should have flourished. 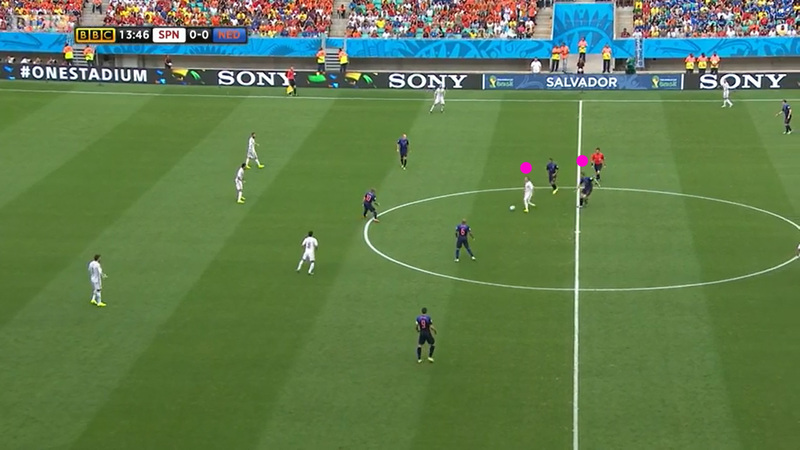 Unusually for a team taking on the World Cup holders, the Dutch didn’t sit deep and let the Spanish have the ball in front of them. Louis van Gaal sent them out in a 3-4-1-2 and told them to press high up the pitch – Nigel de Jong and Jonathan de Guzman disrupting Spain’s rhythm in midfield also meant sacrificing defensive solidity in front of the defence, and Stefan de Vrij and Bruno Martins Indi were tasked with stepping out to pick up the Spaniards popping up between the lines. This meant that Diego Costa was left alone in a battle with Ron Vlaar which he basically lost, albeit not without claiming a penalty from De Vrij. A lesser performance from Vlaar and Spain could have easily been a couple of goals up before half-time, yet the Aston Villa man was imperious, winning the physical battle and constantly shuttling Costa outside. Spain too were playing with a high line and the Netherlands were doing a much better job of exploiting it than the Spanish. With Spain struggling to press against the Netherland’s unusual shape, either the centre-backs or wing-backs were free to hit balls for Robin van Persie or Arjen Robben. If the full-backs went up the pitch to close down the Dutch wing-backs, it only left Gerard Pique and Sergio Ramos two-on-two battle with Robben and Van Persie that they always looked like losing. Daley Blind was the source of most of what was good about the Dutch, with consistently perfect crosses causing the Spanish defence problems, yet simple balls over the top were catching them out just as easily. The final result arguably said more about Spain than it did about the Dutch. 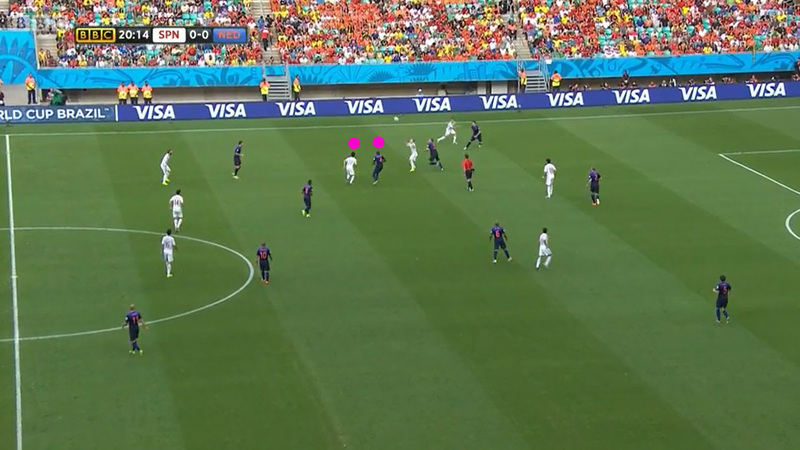 The Netherlands gambled defensively and it paid off, but they had a rather simplistic attacking strategy that embarrassed the world champions over and over again.